Keep in mind wheel-measured horsepower is about 80-90% of the power quoted at the crank due to losses in the transmission and driveline. 180hp at the wheels is in line with 220 at the crank, generally. So, it does look like the exhaust and tune did precisely nothing, but there is definitely more than the NA motors produce at the wheels. he's saying this car should be 260whp. Too bad you didn't put it on the dyno before the mods for a baseline. I'd bet it's the knock sensor. I'd contact KomoTec and ask them about it. What do you meen about the knock sensor could this "steal" the horsepower that is missing? I do not get any fault up when diagnosing the car. You won't get any codes. The knock sensor picks up noises in the block (motor) and if it's loud, it will pull the timing and reduce power. 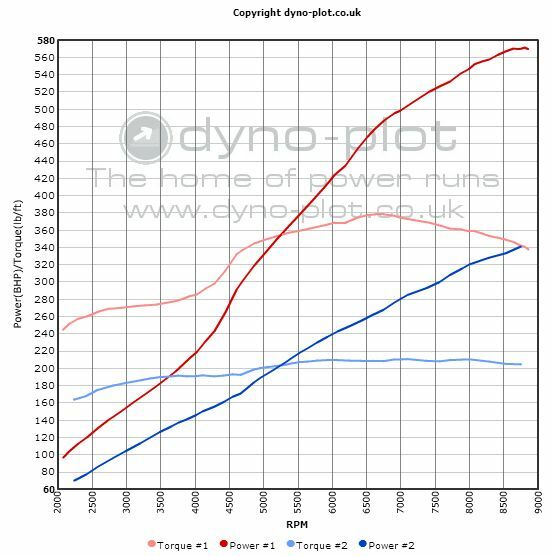 No one knows it's happening until the go to a dyno or feel the car isn't as powerful anymore. It's a known problem on tuned cars putting out lots of power. The fix is to remove the sensor or redo the table of values for the sensor or shut it off via a tune. PLEASE tell me you are running premium gas or higher! The knock detection should be completely OEM. The sensor and detection thresholds should not have been changed ever, so it may be picking up actual knock. If that is the case then disconnecting the sensor will most certainly result in a completely destroyed engine. Do not do that as a diagnostic. Rather, you should be able to plug in an OBDII scanner and read the number if knock events. If that goes up when you do a pull, then the engine is knocking and pulling spark out to compensate and protect the engine. Not enough octane is a likely culprit. The causes are varied though - bad gas, not enough intercooling, too much spark, too much boost, too lean, etc. Here's my baseline. Larini sport exhaust, no cat and ITG drop in filter with no snorkel are the only mods. Car has 25K of miles.. Pretty happy, esp with the 90deg heat and high humidity we had today... but can't wait to get my SC! Nice results! Do you know what size pulley you are running? Komiko sold car. Long gone. Supertrap (costs about 2-3hp, but necessary to pass [email protected] soundmeter). Not spinning to high RPM (mostly because no oil pump gear upgrade). So those things seem to get you up to 30-35 hp beyond what I have, 20-25 more @8500. Not quite sure why we're getting a dip in tq around 4500 rpm with my setup. Looks like my peak tq numbers are already as high or higher than any NA build I've found graphs for. Just need to keep it from flopping so much after 7k and I could maaaaybe break 200, I see intake mods in my future . One pull without the super-trap yielded 195/142. Last edited by fsparv; 08-28-2017 at 06:13 PM.